In Amsterdam a unique parking has been equipped with BB Lightpipe lighting. The two-level parking is situated underneath the Boerenwetering canal in the city centre of Amsterdam, near the Rijksmuseum. 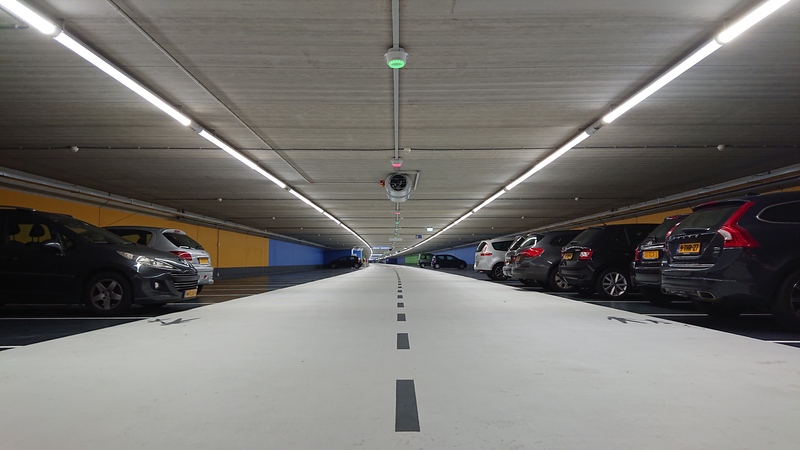 The Albert Cuyp parking is fitted with BB LED lightpipe EVO light lines at the centre of the driveway. The light line has some unique features as well. Emergency lighting, evacuation and park guidance is integrated. The BB Lightpipe is fitted with a fully certified evaquation installation. Speakers, wires and isolators are integrated in the light line. The audio integration is a collaboration with TKH sister company Speeq. 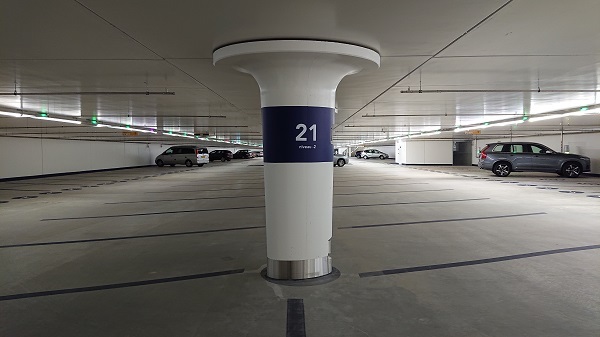 The intelligent park guidance system of Park Assist gives customers the ease of finding a parking space quick and therefore reduce search traffic. The Park Assist L4 system is a camera based system and is placed on top of the light line. Cable trunks are placed on top of the fixtures as well for communication and power wiring according to the daisy-chain principle. A central system based on a UPS and NSA is implemented to power the fixtures in an emergency situation. The BB Lightpipe is fitted with two separate wiring systems for the regular and emergency lighting separately. A build-in addressing module detects when an emergency situation occurs and powers the emergency lighting fixture at 60%. The lighting is controlled by an advanced DALI light management. The parking is divided in multiple control groups which are dimmed with motion sensors. This way energy consumption is optimized. 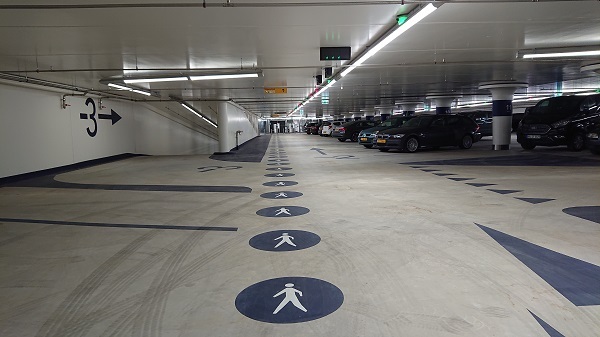 The Albert Cuyp parking is an underground parking facility for 600 cars under the Boerenwetering waterway intended for visitors to the neighbourhood De Pijp and permit holders in the area. The disappearance of a great number of above-ground parking spots creates room for new play­grounds, green areas, and squares. The garage also pro­vides parking for 60 bicycles. For pedestrians, cyclists, and playing children, De Pijp will be immeasurably improved. In 2016 a sheet-pile wall was driven down into the banks of the Boerenwetering, allowing the water to be pumped away. Excavation then commenced for the building of the garage. The site was 300 meters (984 feet) long, 30 meters (90 feet) wide, and 10 meters (32 feet) deep. The biggest challenge lay in building an underground parking lot in a densely populated part of the city with hardly any room for storage and with narrow and constricted access routes. Inconvenience for residents had to be kept to a minimum. Above all, there could be no damage done to the foundations of the 19th-century houses, which stand on wooden piles driven 15 meters (49 feet) deep into the marshy soil. The roof of the garage became the new one-meter-thick concrete floor of the Boerenwetering. In the spring of 2018, water 2.5 meters (8 feet) deep flowed back over the parking lot. Boats pass along the Boeren­wetering once more. To house the required number of vehicles, parking space on two levels over a length of 260 meters (853 feet) was built. Access has to be easy in such a long and narrow space, so long ramps against the outside walls provide for straightforward one-way traffic. To use the width of the garage as efficiently as possible, the cars are angle-parked at 70 degrees. The ceilings are smooth, as almost all cables and ducts were incorporated into the concrete or in the centrally mounted light line. 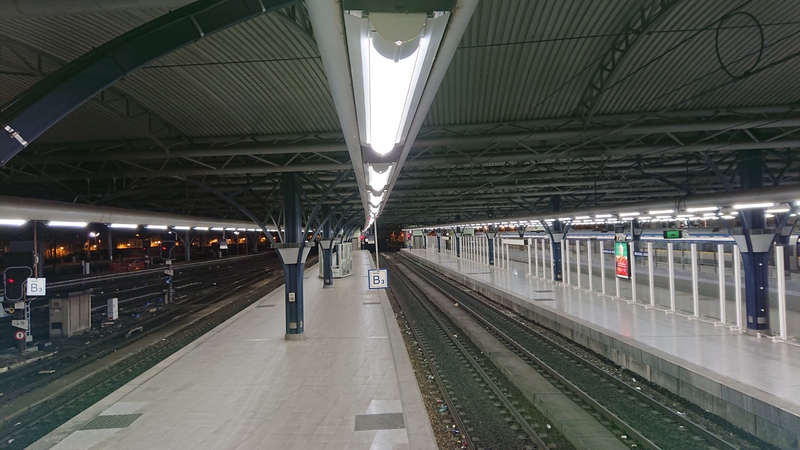 This LED lighting ensures a constant, even and anti-glare light distribution. All this contributes to a pleasant and restful feeling of safety and transparency.